These days, apps have really changed the way we handle our money. You may remember my recent post 5 Money Management Apps You Should Be Using. 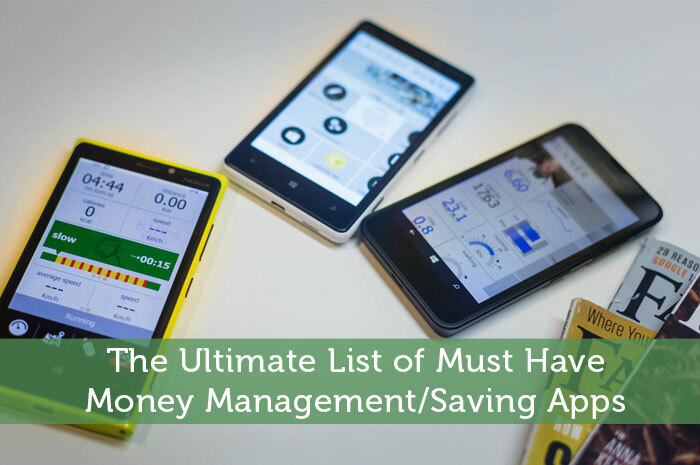 We went over some of my favorites, but that post was nothing compared to what I plan to share today.Today, we’re going to go over the entire list of money management apps I’ve got on my cell phone. Connect your accounts for easy management all in one place. Use great budgeting/savings tools and take advantage of advice in the process. Ads designed to help you! Track investments, and maximize your earnings. Categorize purchases for easier budgeting and money management. Take advantage of tutorials and articles that teach better personal finance strategies. Learn how to spend wisely, and save and invest efficiently. Investing for busy people and newbies. Compare earnings against top portfolios. Easy risk management through stock and bond allocation. Tips to help improve your credit score. MyFICO is like a paid version of Credit Sesame that allows you to access your real FICO score. OK, so we got those five, now let’s go digging to see what else I have in my phone. Scan barcodes of items while you’re in the store. Shop Savvy will search local sources and online for the best prices. Purchase items from major retailers like Wal-Mart with one click. Searches for the lowest price per gallon on gas within your general area. Coupons for tons of retail stores nationwide. Search by store or by product. Many coupons in the system are exclusive to Retail Me Not! Searches for restaurants based deals in your general area. Displays promotions like “Kids eat free!” first. Check in and share while you’re watching your favorite shows. After checking in, Viggle will credit your account and pay you just for watching TV! Decide will let you know if now is a good time to purchase the item or if you’re more likely to get a better deal if you wait a month or two. Search amazon for better deals. Purchase items on amazon directly from the app. Protects you from hidden charges on bills. Makes sure that you are not being overcharged based on your normal monthly bills. Looks for billing errors to save you money. All the functionality of Groupon’s website in a mobile app. Purchase coupons for a savings as high as 80%! OK, so there you have it, I’ve got 14 apps on my phone for saving and managing money. I hope you check them out and enjoy them as much as I do. If you know of any great apps that I haven’t listed I’d love to hear about them in the comments! Excellent list! I’ve been hearing more and more about Credit Sesame so I think I’m going to have to check that one out. And I’ve been trying to remember what Shop Savvy was called! I knew there was an app (well, probably several) for that, I just couldn’t remember the name, so thanks! Also remember Quizzle if you want a score from Equifax. Sweet! I didn’t know that the Amazon app had scanning capability. I have FICO and though I like it, obviously I prefer free. I’ll try the Credit Sesame. As a newer investor Betterment looks good too! My favorite money MAKING apps are Ibotta, Checkout51, Jingit and ReceiptHog. The first three give you cash back on items you buy at the grocery store. The best is when they duplicate items. Once two were giving rebates on milk at the same time. One was for a dollar back on any brand gallon the other was .50 plus another .50 if you had two other offers! I have earned $75 with Ibotta, $12 with checkout51 and $30 with Jingit. ReceiptHog allows you to get coins for any grocery receipt, plus earn extra coins by spinning the wheel. I have just started using this one within the last 6 weeks so I only have 400 coins (1000 allows you to cash in for $5 paypal or amazon). I didn’t see Checkout 51 on here! Is that just a Canadian thing? My cousin told me about it.. it’s an app that you can download to your iPhone that gives you weekly “offers” on groceries and products you can get at the grocery store. When you buy the product in the offer, you get cash back (ie this week they had milk for $0.50 and apples for $0.25) and then they’ll send you a check when you reach I believe $20. You can pair it up with Air Miles, too. This week the app offered 40 extra airmiles if you spend $40 or more at Safeway and they’d give you $1 back. It’s awesome!